Why Are Quizzes So Hot Right Now? Quizzes are enormously popular. Qzzr, a network for quizzes, recently reported a 330% month-on-month growth rate. OkDork reported that 8 of the 10 world’s most shared articles in the first months of 2017 were quizzes. Buzzfeed’s popular “What City Should You Actually Live In” quiz has been taken by over 20 million people. What accounts for the wild popularity of online quizzes in recent years? 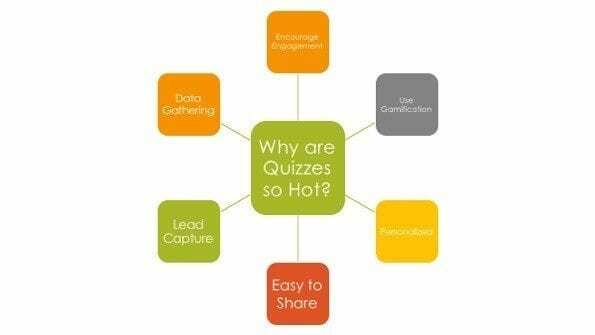 Here are some of the reasons quizzes are so effective as content. Quizzes are addictive. They have a way of hooking people. When a quiz comes across your Facebook feed with an interesting title, you can’t help stopping whatever you’re doing and taking the quiz. The reason quizzes are so engaging is that people get actively involved when they take one. People passively watch videos, read text-based content, and look at images. But you have to think a little to complete a quiz, so the quiz taker is interacting with your content. Quizzes use the concept of gamification, which means adding game elements to a task to make it game-like and fun. If you gamify a work task, for example, it makes you feel like you’re playing a game, even if the task is the most mundane work you must do. The game elements create motivation. We all perform better when we’re having fun. This is another reason for the allure and natural engagement of quizzes. A quiz answers a very basic human desire – the desire to express yourself and be heard. Everyone wants to give their opinions. This gives a quiz an inherently personal aspect. Since people naturally enjoy giving their opinions, they’re more likely to take online quizzes than interact with other types of content. Some quizzes are not informational but geared toward personality types. These are the ones you see that say something like “What Type of Sandwich Are You,” “Which Country Do You Belong In,” or “How Good Are Your Bargain Hunting Skills.” The quiz not only asks you about yourself, but also evaluates your personality and tells you about yourself. This appeals very highly to the nature of social media and the information-seeking side of the internet in general. Online quizzes are shared like crazy and often go viral. This is because of the engagement, personalization, and gamification mentioned above, but also because they’re perfectly designed for social media content. A good quiz is quick and easy to take. You get results within a minute of starting. Most quizzes give you the option of sharing your results on social media, and this is irresistible. When your friends see your quiz results, they naturally want to take the quiz themselves. Shared quizzes on social media are also conversation starters. Your friends will compare their results and discuss with each other, which means more engagement with the content. Like other forms of online content, quizzes are great for capturing leads and bringing people into your sales funnel. You can get your quiz takers to sign up for your email newsletter or follow you on social media easily once the quiz is done. Quiz platforms offer the option of forcing quiz takers to sign up in order to see their results. Another option is to offer a free incentive for taking the quiz. All of these tactics can be used to bring people on to your list of leads. You can fashion your quizzes in such a way that they become a tool for gathering data about your target market. Create a quiz that asks questions about the person’s opinions, but which also tell you how they shop, what they like in a product, what they’re looking for, what brands they love, and so on. 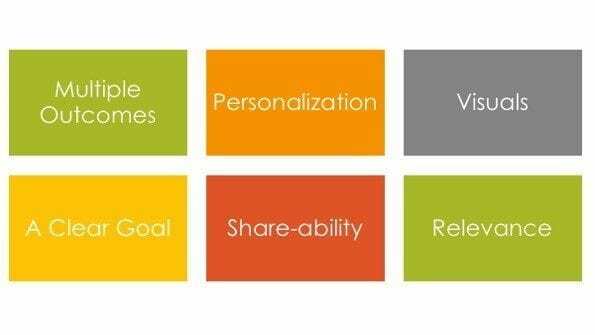 Quizzes are one of the most popular types of online marketing content for engaging with your customer. For a quiz to work, there needs to be multiple outcomes. If everyone who takes it gets the same result, it’s not a personalized experience anymore, and it’s certainly not very interesting. Once people start sharing it, they’ll realize it’s not a very well made quiz. In addition, one person may take the quiz multiple times and get different results. Your quiz needs to feel personal to the quiz-taker. They should feel that it’s designed for them (You can create quizzes that feel this way by knowing your target market well). The quiz needs to be about the person taking it, and the result needs to feel accurate. Visuals add to the fun, game-like element of a quiz. A good visual also helps it attract people’s attention when it appears in their social media feed. It gives a sense of what they can expect from the quiz and can also be used for branding (for example, all your quizzes should use the same visual format). Your online quizzes need to lead somewhere or else they’re a wasted effort. The purpose might be as a lead magnet to get new leads for your business. The goal could simply to be raising awareness of your brand. Your quiz puts you on your target market’s radar so that they start looking at other content. Whatever it is, you need a goal since it’s the starting point that decides who you target, what questions you ask, and how you build your quizzes. Quizzes MUST be sharable. If the quiz is entertaining, highly targeted, and achieves its goal, it will certainly be shared by those who take it. This is how a quiz goes viral. The topic of your quiz must be relevant to those who take it. You must know your audience and choose a topic that is interesting or entertaining for them. 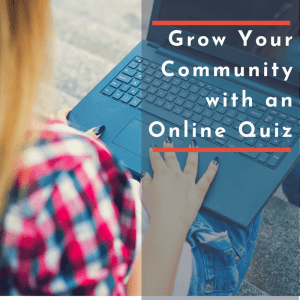 Setting up your online quiz is easy using a quiz platform or plugin. Once you set it up, you should test it to make sure it works and delivers the results the way it should. Then, once you launch it, monitor and measure results to make sure it’s working the way it should be. Here are two quiz platforms that I have personally used on my client’s sites and that I highly recommend. This is a tool that’s also designed for businesses to use. Thrive Quiz Builder is a WordPress plugin so it’s easy to add to a WordPress blog or site. It’s designed to make designing, sharing, and embedding your quizzes easy and offers an array of templates to choose from. Simple Quiz Engine is also a WordPress plug in that makes it easy to add a quiz to your WordPress web site or blog. With each purchase, you also get a quiz checklist that walks you through the entire setup process from start to finish – no prior quiz building experience necessary. Both of these platforms integrate easily with many auto responder /enewsletter tools such as aWeber and Mailchimp. For lead capture, you’ll need to outline and write a sequence of emails to follow the quiz. The first follow-up email should offer the results of the quiz if that’s how your quiz is designed and thank the person for subscribing and remind them of the benefits that they’re going to get through their subscription. For example, thank them and tell them they’ll get a weekly news roundup and occasional exclusive promotions. This confirms to the person that they’ve signed up for the right list and reaffirms the reasons they signed up. You can use your subscribers to further narrow your target market. At first, you identified the target market for your quiz and your offer. If done successfully, you’ve gotten people from this market to sign up for your list. With different quiz outcomes, the right quiz platform will let you then segment your sign-ups based on their resulting outcome. Now, you can send them relevant, informational content and offers, and use this to further narrow and understand who they are. List management software allows you to track things like open rate and click-through rate. Your offers help you to further qualify prospects. If you offer a free information product, those who download the product are those who are most interested in your content and offers. You can offer small ticket items to see who buys, and then you know that these are your potential buyers. There are a number of places where you can publish your quizzes. Quizzes can also be embedded on your website or blog. Since quizzes work so well on social media, you should definitely publish your quizzes on Facebook, Twitter, or wherever else you have a social media presence. When you post on social media, your content gets shared, liked, and commented upon, and then quickly disappears as new content comes along. All major social media platforms offer a way to ‘boost’ your post. These are paid methods which are reasonably priced, and pushing your quiz back into people’s newsfeed can really amplify its engagement. In addition to sharing your quizzes, you can also create content about your quizzes. For example, write a blog post sharing the answers to your latest quiz. You can tell your readers that the average score on your English grammar quiz was 70%. This makes your readers want to take the quiz themselves to see how they fare against others. On offline promotional material, mention your quizzes and give people a URL where they can find them. An even better idea is to offer a QR code that people can simply scan and then take the quiz on their smartphone. Online quizzes can make a big difference in your marketing efforts. 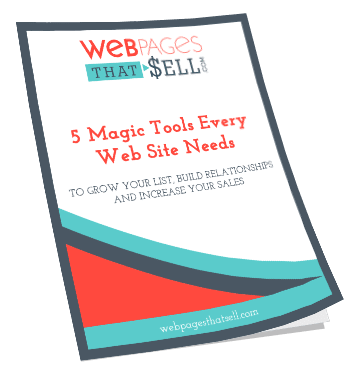 They are easy to set up, create a fun and interactive way for your web site visitors to engage with you and give you the information you need to offer your audience what they are looking for! It’s a truly demoralizing experience to have your website get hacked. It feels personal, and it feels overwhelming. If you’ve experienced this in the past or are experiencing it now, I truly am sorry. It’s estimated that as many as 30,000 websites are hacked every single day, so you are not alone. 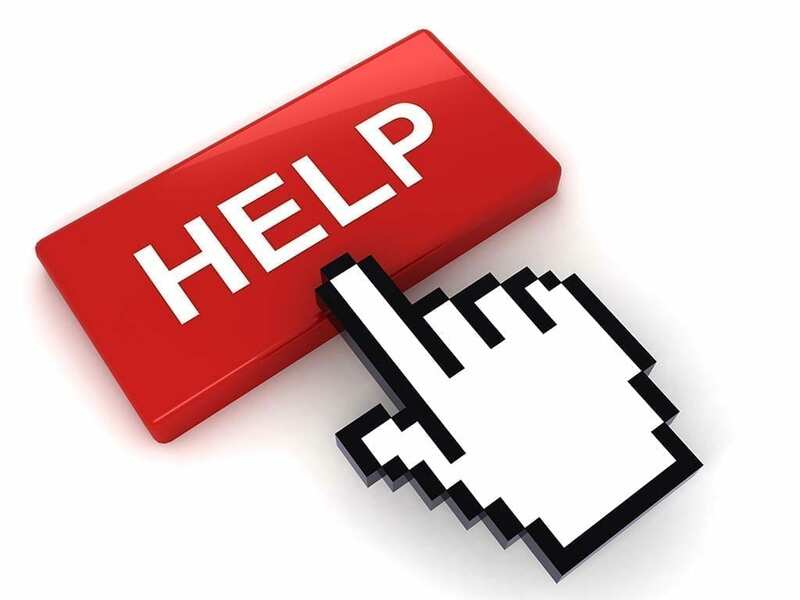 The good news is, with some help, you can get your website up and running once again. 1. Contact your website host provider. The first thing you should do when your website gets hacked is contact your website host provider. Your website might be one of many websites that were hacked on your website host’s server, and if not, your host provider will want a heads up yours has been compromised. Depending on your website host and what kind of website you have, you may be able to do this right away. For some websites, the control for taking your website offline is in your hosting control panel. If your website is redirecting to another page or displaying content other than what you put there, taking your website offline will keep your visitors safe while it gets worked on. Sometimes your website can get hacked because of malware that’s already on your computer, and sometimes your computer gets infected from your website. Either way, you’ll want to make sure your computer and all your information is secure. In order to get malware off of your website, you’ll need to talk to someone who is competent and someone you can trust to clean your website. A web developer will help you figure out how your website got hacked, remove any extra code, repair corrupted code and help you add security. You’ll want to change any password connected to your website, so that includes the password to your website hosting. When coming up with a new password, make sure it’s hard to guess, contains at least eight characters, has one uppercase letter, one lowercase letter a number and a symbol. If you’re currently experiencing a website hack, we can help. Our service, Speedy Sites and Malware Protection will clean off any malware currently in your website and provide ongoing protection so you can have peace of mind in the future. To get started, you can click the banner below or contact me if you’d like to discuss what’s happening on your website. When it comes to website building, there are a lot of tools available to the everyday consumer and professional site builders alike. In fact, there are so many different website platforms it can feel confusing to navigate. What are the advantages and disadvantages and how do you know which one is right for you? In this blog, we’re going to breakdown a few and assess each one’s strengths and weaknesses. 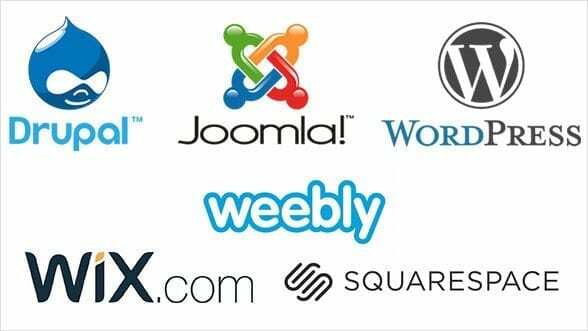 Before we get into the different platforms specifically, it’s helpful to know that WordPress, Square Space, Wix, and other website builders like them are “Content Management Systems” or CMS for short. These websites are designed with the user in mind, meaning you don’t have to contact a developer every time you want to make a small change. While the idea of making changes to a website can sound overwhelming, the truth is if you can create something in Word, Excel or PowerPoint, you can use one of these CMS systems. You just need the proper training. As you’re learning a new system it’s important to give yourself grace until you get the hang of it. If you don’t understand the first time, that’s perfectly understandable, and you can always give us a call if you have questions. Keeping this in mind, here’s the four most popular CMS website platforms, and each’s strengths and weaknesses. WordPress is the website builder I primarily work in, and I believe the benefits to WordPress far outweigh the negative s. Almost 70% of websites run on it, and there’s a good reason for its high popularity. For one thing, you have a lot more control over the look and feel of your website if you use WordPress. Branding is easy because of the robust features the platform offers. As websites continue to advance, new tools come to the market that can solve problems, help with SEO and give you more creativity. Typically, these tools go to WordPress first, and because of that you can always stay on the cutting edge of website building. You’re going to have a lot more support on WordPress and you’ll never have to worry about not being able to do something because you don’t have the right equipment. The downside to having a site that runs WordPress is that it’s prone to malware attacks. You have to constantly make software updates, plugin updates and theme updates. While these updates aren’t difficult, you do have to stay on top of them. Square Space is one of those tools that’s very easy for the individual to make their own website. Basically, you go, you pick a template, you create a website. The drag and drop feature is what makes it so appealing because it’s so intuitive. It has some built in tool s to help with adding content as well. When looking at Square Space on the front end, you might not see some of the downsides. However, Square Space is difficult to customize if one of their templates isn’t exactly what you have in mind. Updating Square Space can be clunky, and surprisingly, is more expensive to host over time. Wix is a lot of fun. They have some good templates and it’s very easy to do yourself. Wix has a really good relationship with Google, which isn’t particularly well known, but can help with your SEO. The templates are limited, but they are still diverse. It’s a very “paint by numbers” system which you can customize colors and pictures. If you aren’t going to use WordPress to build your website, Wix is definitely the place to go. Web Pages That Sell can help you setup Wix or answer any questions you may have if you’re having trouble getting started. The downside to Wix is its limited ability to share blog posts and the plug in’s you can use. For instance, Wix doesn’t even have a plug in for MailChimp. If you want to use an eNewsletter service, the only option is for you to use their version. Hosting Wix can be more expensive overtime than WordPress as well. Weebly is like Square Space and Wix in that it’s very drag and drop. People can feel really comfortable using Weebly right away, because all the skills they’ve acquired surfing the internet are employed when you build with Weebly. However, you don’t have a ton of control over the look and feel of your website. Weebly is best for people who are starting up a business or you need a way to get information up there. When I have a lot of people coming in from out of town for a party or another organized gathering, I make a Weebly website. It’s good for the newcomer, and though the templates might be plain, they’re not ugly. Joomla and Drupal are two websites that I personally do not have a lot of experience working with, but I’d love to refer you to this article which explains the platforms really well. Each of these Website platforms have strengths and weaknesses, and every website will still need a mix of great content, SEO and easy navigation for its visitors. In the world of website building, there is no such thing as. “if you build it, they will come”. If you want to see results from your efforts to get your voice out there, then the work must be put in. If you’re wondering what kinds of solutions Web Pages that Sell can offer you, we’d love for you to fill out our contact form and schedule a time with. Even if you have some basic questions about being trained to use websites, we’re looking forward to hear what you’re dreaming up. Did you ever want to create a facebook image that’s really intended for social media? You know the ones with the cool quotes and messages that everyone likes to share? Now that it is Thanksgiving in the United States, maybe you would like to create your own Thanksgiving message. That is exactly what we are going to do today! I have created a video that shows you how to get the right tools and how to create a nice looking image to use on social media in less than 10 minutes, all using free online tools. In this tutorial we are going to find an image and jazz it up for your online marketing use. 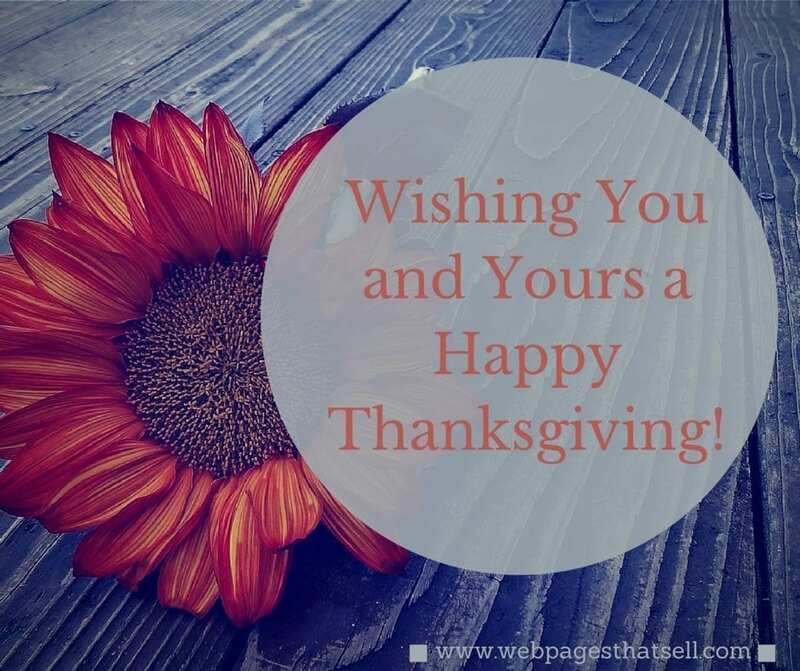 In this example we are going to create a Facebook post with a Happy Thanksgiving message. Please note that this is a great way to build awareness for your website. In this example you can see that I have added my website in the lower right hand corner. If people like my image and they share it – my website info gets shared along with it. Not a bad way to get a little website traffic. In this tutorial we will use the following free tools. A little bit about the tools we are using and how to access them. Pixabay is a site that offers free images that you can download. They can be used for commercial use. You will notice that they have some images with a shutter stock watermark – these are the images that they sell and that is how they make money on this site. When you download an image, you also have the opportunity to buy a cup of coffee for the photographer. Colorcop is a tool that allows you to use an eyedropper to match a color number so that you can set your color easily. This is a free download from colorcop.net. In this tutorial you will see this tool IN ACTION. This tool only works on PCs, but if you are using a Mac – check this one out: http://www.colorschemer.com/colorpix_info.php. Canva.com is a website that offers free and paid options for creating anything from a Facebook timeline cover to a blog post image. You will need to set up a free account with Canva. In this example all options that we used were free of charge. After installing the color picker and getting a free account with Canva.com, our first step will be to choose a photo that we are going to use. In Pixabay I typed in the word, Thanksgiving. This brings up several pages of great photos. The photos on the top are the paid options from Shutterstock and perhaps I might find the PERFECT one and be willing to pay for it. But in this scenario I found the perfect image amongst the free items. Click on the image to download and save it to your computer. The next step is to log into your Canva.com account. Since this will be for a Facebook post, I am going to choose Facebook post – but as you can see you can choose from several options. Once I choose this I am given a lot of very cool layouts to choose from. I am going to choose the first one. I want to use the picture that we found on Pixabay and so I will go to Uploads and upload the image. Drag it over to the layout and it replaces the image that was on Pixabay. I want to update the text that is in the circle. I just deleted all the extraneous verbiage – however you could certainly use them – and I will simply write my Thanksgiving message. Now I want to add my website URL so people know where it came from. I click on text and found all these cute text options. The colors for these components are not quite right, so I am going to use my colorcop tool to pick out the colors from the photo we are using. Click on the element and it will allow you to choose the color. I copy the color number from colorcop and paste it to the color option for the element. Once I am done, I can save my image and download it to my computer. Voila! We have our image! Entrepreneurs come from all walks of life and many people would not think of Mother Teresa an entrepreneur. I am very fortunate and grateful to say that I had the most wonderful opportunity to meet with her personally and be a part of her organization when I volunteered at her Missionaries of Charity in Calcutta, India. This prompted me to learn more about her journey as well as visit some of the establishments she created. Did you know that prior to starting her order, she was a principal of a school for affluent girls? She was in her late 30’s when she received her calling from God and was in her early 40s when she began her work that she is most famous for. Does that sound at all familiar? Many of my clients were working in their full-time salaried jobs and either by choice or by circumstance found themselves on their own and realizing that they had a big message or calling to share with others and went out on their own. 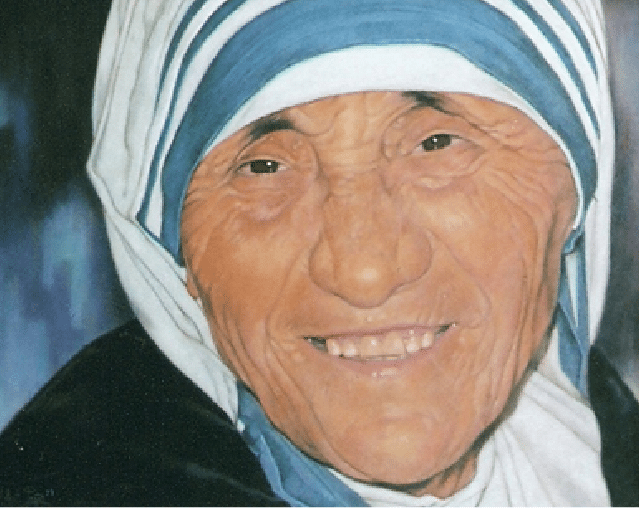 The first task that Mother Teresa took on was to create the House of the Dying. The location she chose was very close to a well visited temple and attracted people from all over. When the city council and neighborhood authorities heard of her plan to create a place for homeless dying people to reside, what do you think their reaction was? Keep in mind that she was not known by anyone at this point. Let’s just say that having this facility in their backyard was not high on their agenda and it was met with extreme opposition. She had to sell the idea to the authorities and build the relationships to help this cause. In addition she had to procure the necessary items that would be needed, build a team a willing volunteers, and convince her “customers” to come and that it was a safe place. Building the House of the Dying was a major feat and was filled with hurdles. Do any of you feel this way? Mother Teresa was one person. She was given the vision and she had the courage to follow this vision. But she had to take all the tedious and monotonous steps to make it a reality. She had to overcome objections, advertise, purchase supplies, etc etc. Each action took her to the next step and she went on to create a worldwide phenomenon in her lifetime. We all have this ability and this power. What is your mission? What is your big message? Why should you use a Facebook feed on your website? This info-graphic gives some compelling reasons! Levi’s -40 times increase in referral traffic from Facebook. Giantnerd.com-100% increase revenue from Facebook within two weeks of adding the Like button. Tea Collection- daily revenues increase 10 times.